Boris Mikhailovich Kustodiyev is a great master who glorifies the Russian life, the Russian way of life, the Russian soul. Most of all, the soul of the Russian people was revealed during general festivities. The native Russian tradition of the celebration of Maslenitsa was especially attractive for the artist. It is on such days of universal nationwide festivities that such a many-sided Russian people unite. Here, exactly at the fair, everything mixed up, a bright merry-go-round circled. Kustodiyev at different times of his work created a whole series of paintings, united by a common theme of the celebration of Maslenitsa. In 1919, B. M. Kustodiev wrote another painting called “Maslenitsa”. Shrovetide festivities are depicted in this work most vividly, in a dense, thick stream of joyful waves of noisy conversations, jerky looks, loud laughter and shining, heated faces. The atmosphere is characterized by an abundance of snow, an abundance of people. A kind of redundancy effect is born. Excessive colors, sounds, various grocery amusements. All this creates a motley decorative picture, similar to a lush, very rare and very beautiful decoration. The celebration takes place in the central square of one of the small provincial cities of Russia. This can be judged by the set of all kinds of shops that have turned around. There is a bakery here, and fruit, and groceries selling cheese and caviar, and in addition, a theater. The landscape is urban, cheerful, Shrovetide covered with snow and hoarfrost. Around every shop crowd crowds, someone plays the accordion, buys colorful balloons, argues, gossips, bargains, desperately has fun, forgetting everything. The central motive of the canvas can be called Maslenny horse riding, which encloses a delicate cultural symbol of comparison of Russia and the troika. “Isn’t it so, you, Rus, that the brisk, inexperienced troika is rushing? Smoke smokes the road under you, rattles bridges, everything lags behind…” – N. V. Gogol asked, referring to the restraint, wild power, power of Russia. And above all this, as in many other works of Kustodiev, the image of the cathedral and the pale sky, as if glowing from the inside, rise. Large images of trees covered with snow covered with a thick snow hat give rise to a poetic feeling of a “wonderful city”, the image of which merges into a single general state of fun, carefree laughter, songs, games and strong enthusiasm for Maslenia skating. The canvas “Maslenitsa” is very interesting to consider, study, so detailed and skillfully written work. The picture bears in itself and excites in us a kind of overlap of emotions, delight, interest, infects us with the magic of the holiday, awakening a very childish joy from the arrival of spring. Thus, it turned out quite complicated, “overloaded” with details and images of the plot canvas, resembling a fabulous illustration, which is characterized by a grotesque, special, too decorative language, an abundance of jewelry, details, hidden riddles, implicit allegorical meanings. 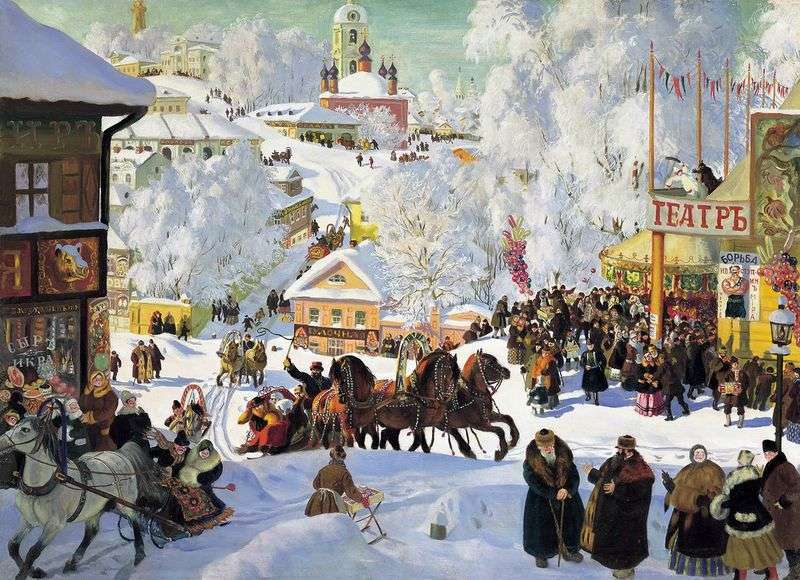 Description and meaning of the painting Maslenitsa (Pancake skating) by Boris Kustodiev.